By moonlight on 18 July 1853 a tall, handsome man dressed as a Catholic priest climbed stealthily aboard the sailing ship Emma moored on the Derwent River a few miles downstream from Hobart Town.The Captain, who had been waiting expectantly for several hours, nervously chided, 'You were almost too late, Mr Wright', but knowing his true identity, remained as silent as the moonlight that beckoned the ship northward to New South Wales. 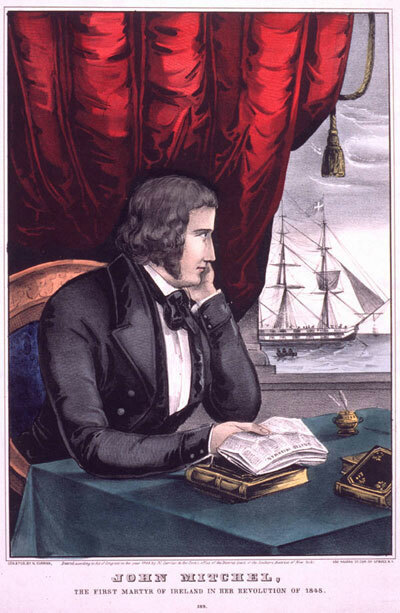 As morning broke, and daylight saw the Emma,with all sails set, ply the eastern coast of Van Diemen's Land bound for Sydney, Mr Wright, alias uncompromising Irish nationalist John Mitchel, rejoiced at being the fourth Young Irelander to successfully escape Van Diemen's Land.1 The episode was the dramatic result of many months’ planning by Irish supporters and sympathisers in Van Diemen's Land and New York, and was subsequently celebrated by Irish nationalists around the world as a sign of Irish defiance against British rule and oppression. 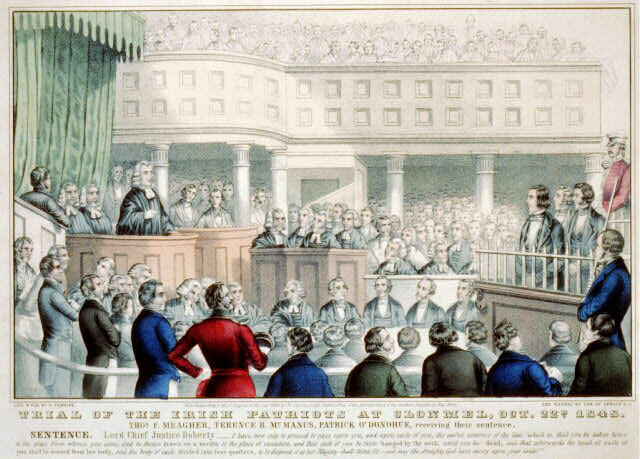 Such was the public feeling that when Mitchel finally reached New York in late October 1853 he received a thirty-one-gun salute and was heralded as president of the not yet established Republic of Ireland. The historical importance of the Young Ireland movement lay in its role as a catalyst for Irish nationalism and as a precursor to other important Irish political movements. These include the Irish Republican Brotherhood, founded in Dublin in 1858, from which stemmed Fenianism, as well as the Sinn Fein movement and the Irish Republican Army of the twentieth century. The Young Irelanders were avowedly non-sectarian and fundamentally saw their charter as promoting a religiously pluralist sense of Irish cultural nationality. But if, from the early 1840s, they initially sought to peacefully affirm and promote Irish identity, pride and self-respect, this soon changed. The onset of the Great Famine of 1845-1849 stimulated the Young Irelanders to more militant political action. Appalled at British imperial economic policies that provided inadequate relief for the desperate and dying Irish peasants during this period, they rebelled against British rule in favour of an Irish Republic. It was for their revolutionary zeal that the British government transported some of them to Van Diemen's Land. This short historical account is divided into four parts. The first section introduces some of the key figures in the Young Irelander movement who were not transported to Van Diemen’s land as well as the fifteen Young Irelanders who were. Emphasis is placed on the seven Young Irelanders who are the main characters of this synopsis. Section two briefly surveys the political background to the Young Ireland movement in Ireland and the reasons the Young Irelanders were transported to Van Diemen's Land. The third section charts their exploits in Van Diemen's Land and the places they dwelled and frequented during their incarceration. The final section briefly notes the fate of the most famous Young Irelanders after leaving Van Diemen's Land and their significance as subjects of interest to tourists and Tasmanians alike. For Mitchel's description of his escape see John Mitchel, Jail Journal, Dublin, 1913, pp. 304-339. P. Robertson, Revolutions of 1848: A Social History, Princeton, 1971, pp. 408. R. Davis, The Young Ireland Movement, Dublin, 1987, p. 1.